The island of Puerto Rico was one of four territories surrendered by Spain after the Spanish-American War of 1898. Cuba gained its independence, but Puerto Rico, Guam and the Philippines became possessions of the United States. The U.S. renamed the island Porto Rico – even though the word porto does not exist in Spanish! The correct spelling was officially restored in 1932. Puerto Rico's first railways were built under Spanish rule and generally used European equipment and track gauges. Its main line, the 300 mi/475 km Ferrocarriles de Puerto Rico, which opened in 1891 and circled the island, was built to meter gauge, which was unknown in North America and rare in the Caribbean. The new owners renamed it American Railroad and marked the locomotives "A.R.R." The first railway in the San Juan area was the 7 mi/12 km Tranvía (Tramway) de Ubarri. It opened in 1880, was powered by small steam locomotives, used 29.5 in/750 mm gauge and was later called Tranvía de la Capital. 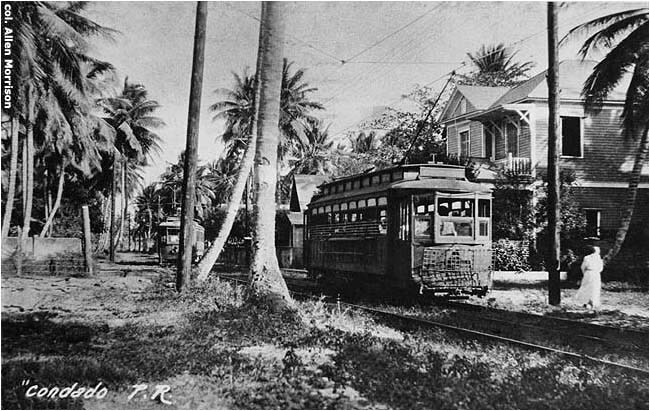 The line ran from Old San Juan along Av. Ponce de León to Río Piedras [see map]. 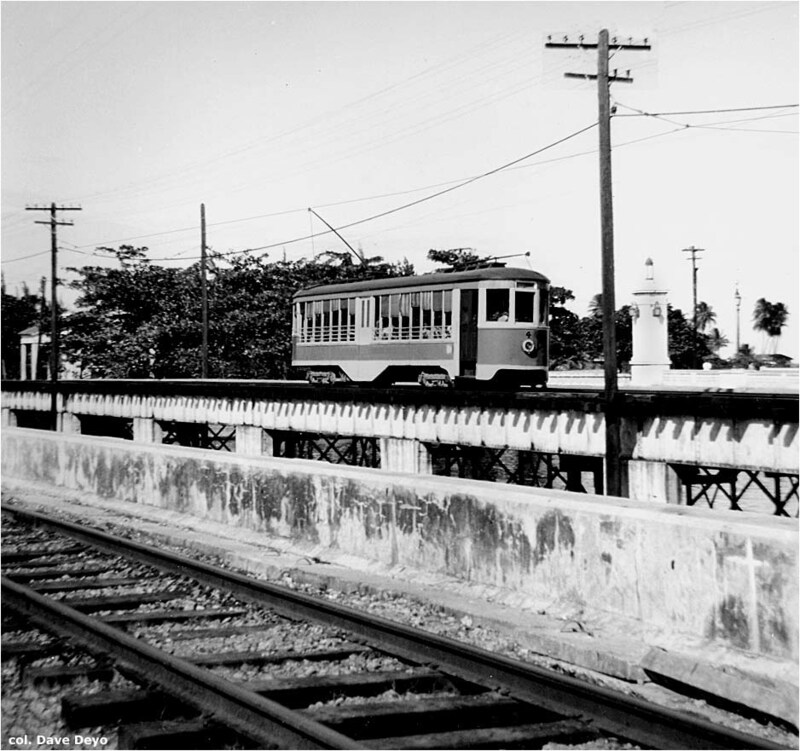 The area's second railway was the 4 mi/7 km Línea Férrea del Oeste (Western Rail Line), which opened in 1883 and connected Cataño and Bayamón across the bay. It was operated by the Compañía Férrea del Oeste and used meter gauge. 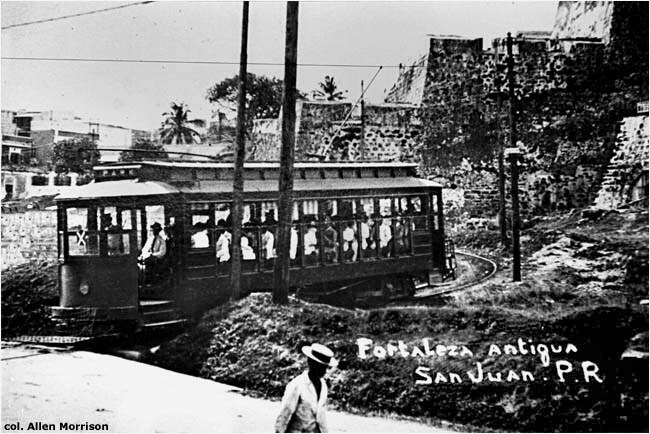 The two San Juan steam lines ran along wagon roads and were called tranvías (tramways), but could just as well have been called suburban railways. 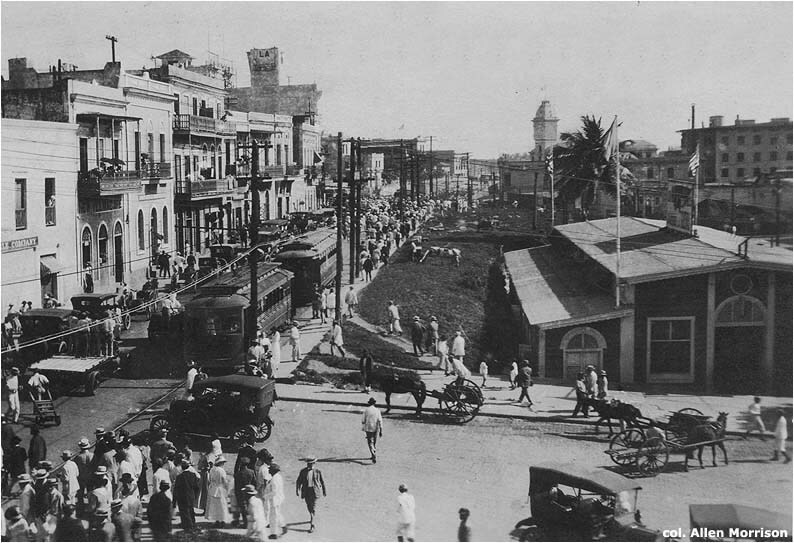 San Juan never had horsedrawn trams on its streets. J. G. White graded the extension and began laying standard gauge track, but Caguas Tramway changed its mind and decided to build a meter-gauge steam line instead, in order to provide interchange with the meter-gauge American Railroad, which it intersected in Río Piedras [see map]. The rails were moved over. Overhead wires were never installed. 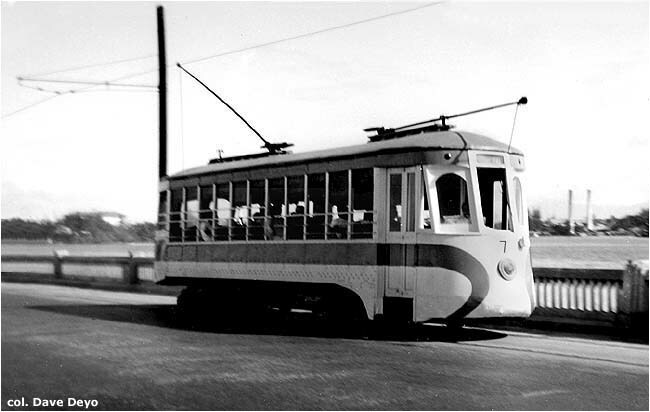 The new Brill cars never ran to Caguas but were instead renumbered 18-25 and used in San Juan. PRRL&P's Río Piedras - Caguas steam railroad opened in 1908. 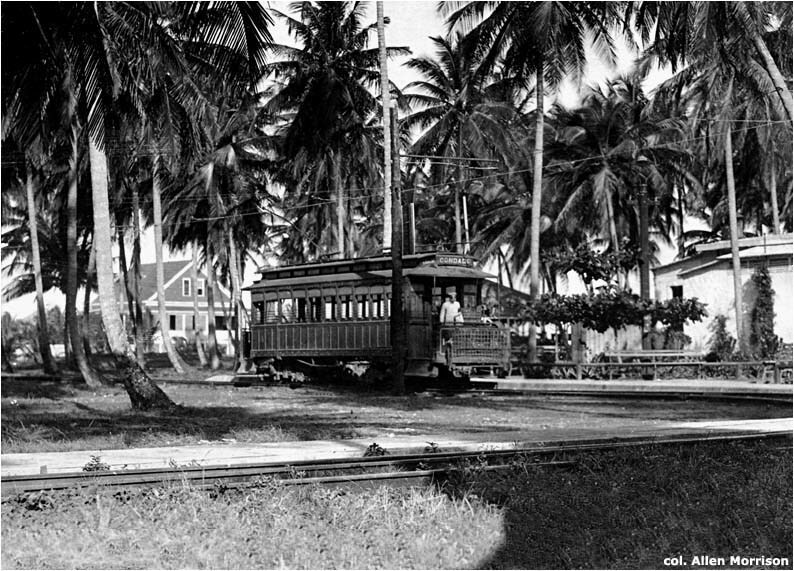 Despite the name on the Brill cars, which has misled historians, the city of Caguas never had a tramway, nor did trams ever run between Río Piedras and Caguas. The steam railroad was never electrified and closed in 1928 [see below]. 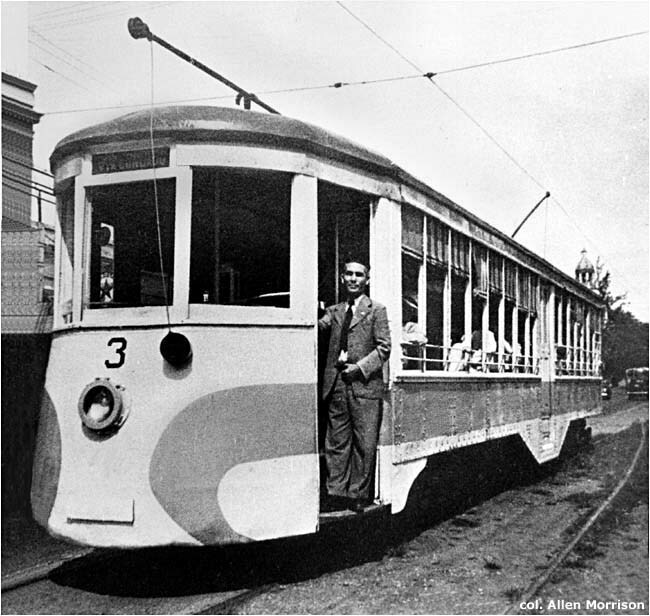 The Water Resources Authority/Autoridad de Fuentes Fluviales ran the last tram in San Juan (and Puerto Rico) on Monday night 30 September 1946. (Actually, according to newspapers, the last car, Perley Thomas number 4, pulled into Borinquen yards at 0:45 am 1 October [see map].) A rich chapter in Puerto Rican transport history had come to an end. 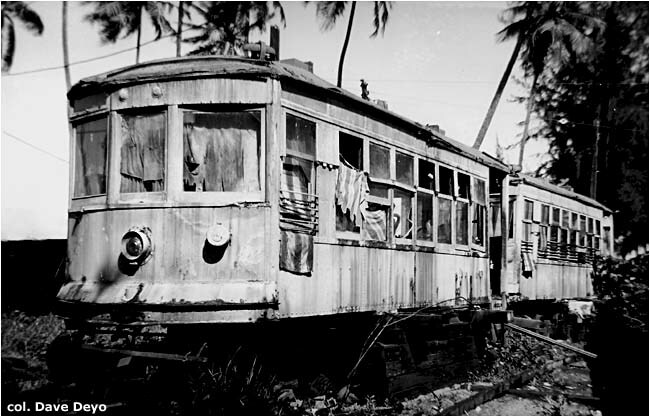 The American Railroad ran its last train in Puerto Rico in 1957. Construction began forty years later, in 1997, on the first stage of a heavy-rail metro in San Juan, called Tren Urbano. The initial 10.5 mile line, between Sagrado Corazón station in Santurce and Bayamón, began free rides for the public in December 2004 and finally inaugurated full commercial operation on 6 June 2005. Most of the line is elevated, but has a mile of tunnel, with two underground stations, in Río Piedras. 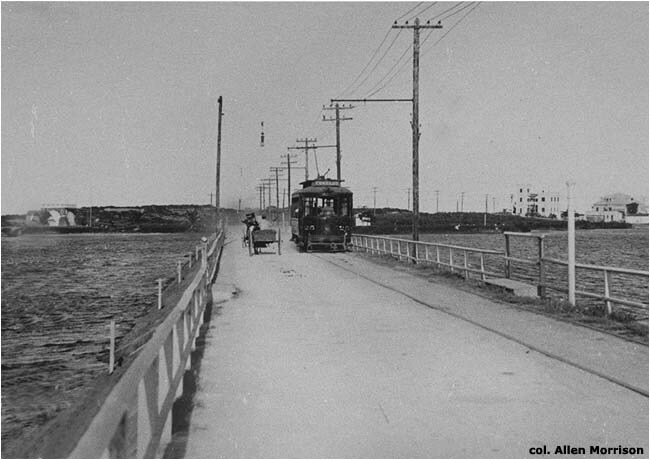 "Trolley Road in Porto Rico" in Street Railway Review (Chicago), 15 January 1899, pp. 14-15. Good short article about the reconstruction of the San Juan & Río Piedras Railroad as an electric line. Eleven unlabeled photographs of the steam line (but not of its vehicles). 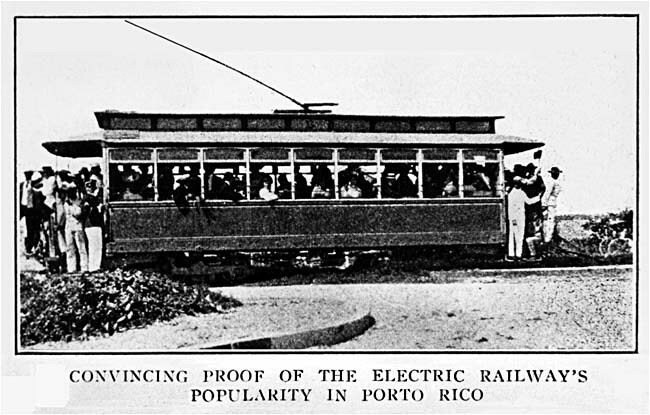 "Tranvía Eléctrico" in La Correspondencia de Puerto Rico (San Juan), 4 February 1901. 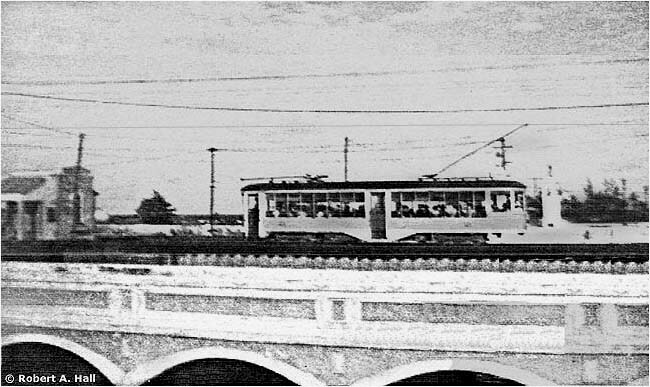 A short article announces the operation of the first electric tram in the city – but doesn't indicate the date. "Electric Railways" in Electrical Review (New York), 16 February 1901, p. 233. 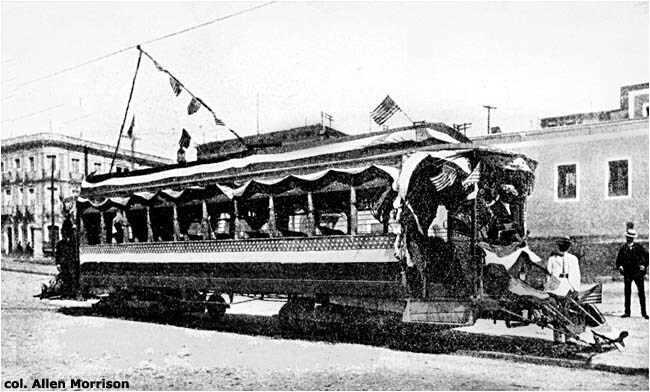 A news item announces the inauguration of San Juan's "new trolley system" on 1 January 1901. 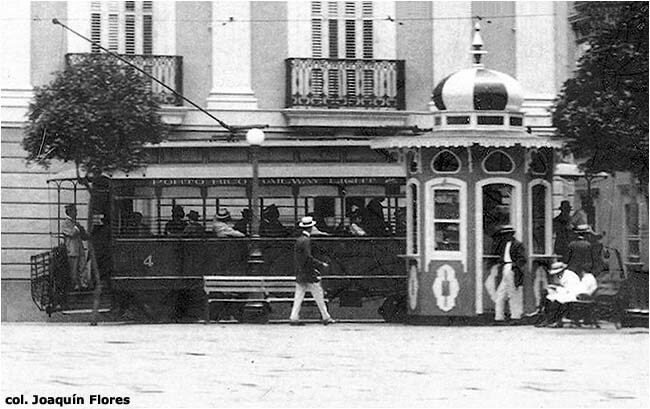 "The Electric Railway at San Juan, Porto Rico" in Street Railway Journal (New York), 23 September 1905, pp. 446-448. Good, long article about the new electric tramway. 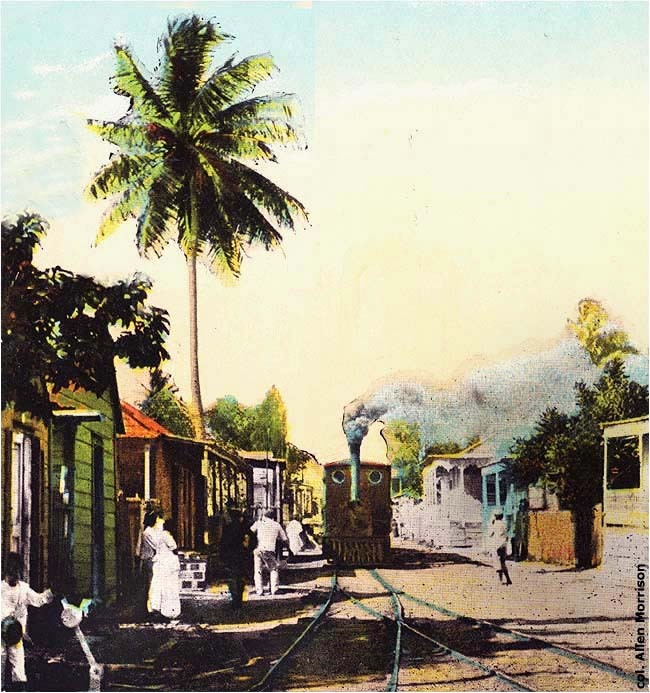 Six illustrations, including a view of a horsecar in Mayagüez (incorrectly identified). "Brill Semi-Convertible Cars for Porto Rico" in Brill's Magazine (Philadelphia), October 1907, pp. 192-195. 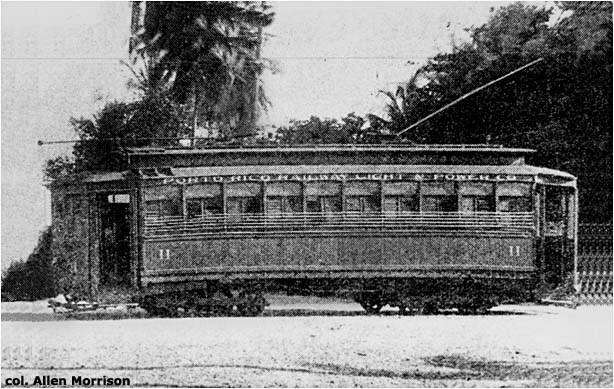 Nice article about the eight trams that J. G. Brill built for the "Caguas Tramway Company". Good description of the vehicles and also of the line under construction between Río Piedras and Caguas. Five pictures. "Baggage Car with Steel Underframe for Porto Rico" in Brill's Magazine (Philadelphia), February 1908, pp. 41-44. Long article about construction of the Caguas line and the rolling stock built for it. Four pictures. 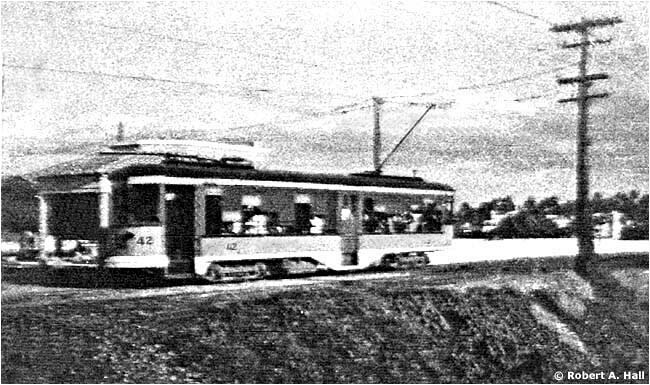 "Trolley and Power Developments in Porto Rico" in Street Railway Journal (New York), 22 February 1908, pp. 274-277. Construction of the San Juan tramway, the Caguas extension and the dam and power plant at Comerio Falls. Map and 10 photographs. 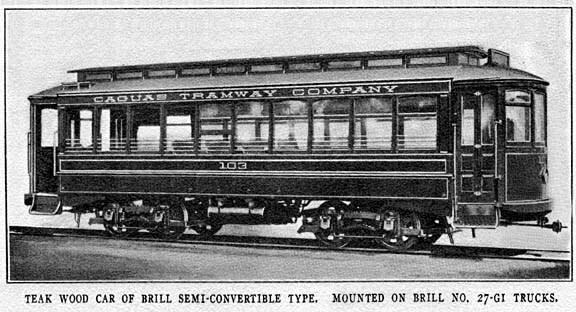 "Brill cars for Steam Railway Service in Porto Rico" in Brill's Magazine (Philadelphia), August 1908, pp. 185-187. 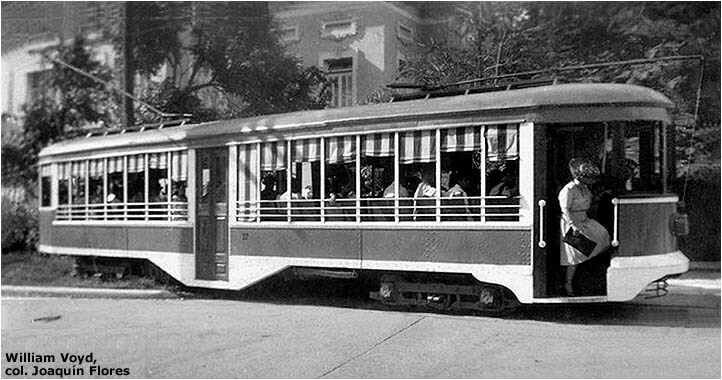 Description and picture of passenger car 106 built for the Caguas railway. "Interesting Cars for Porto Rico" in Brill Magazine (Philadelphia), May 1911, pp. 141-145. Description and four illustrations of the jaulas (screened cars) shown on this webpage. McGraw Electric Railway Directory (New York), 1918 and 1924 editions consulted. 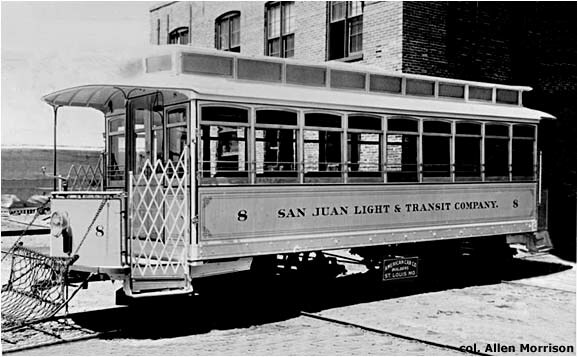 Corporate data, technical descriptions, inventory of rolling stock, track length, etc., of the San Juan tramway. 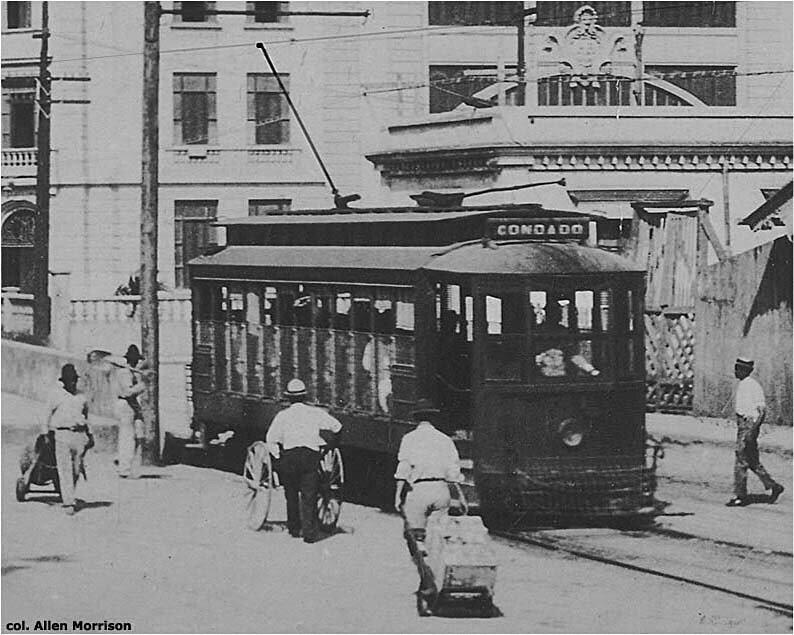 "Tranvía de San Juan" in Informe del Comisionado del Interior al Gobernador de Puerto Rico, 1919. 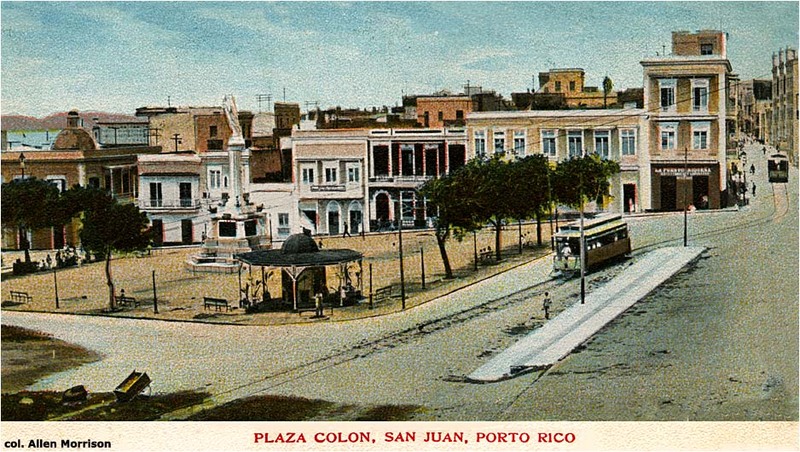 San Juan, 1919. Nice system history, from steam through the early electric days. Eugenio Fernández y García. El Libro de Puerto Rico/The Book of Porto Rico. 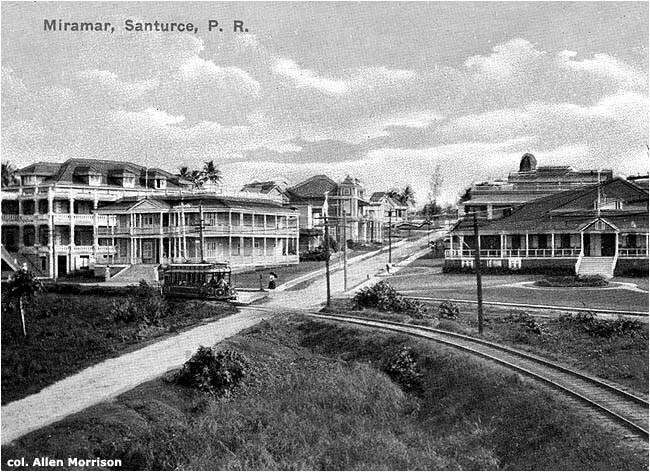 San Juan, 1923. Photograph of the gasoline-powered car of the Línea Férrea del Oeste on p. 703 of the English-language edition. "Porto Rico Railway Gets Six New Two-Man Cars" in Electric Railway Journal (New York), 23 April 1927, p. 761. Specifications, drawing and two photographs of new Perley Thomas vehicles. "Revenue Doubled by Modernization of Porto Rico Railway" in Electric Railway Journal (New York), 31 December 1927, pp. 1193-1195. Acquisition of new Perley Thomas cars, reconstruction of old cars. System map (!) and four excellent large photographs. United States. Bureau of Foreign & Domestic Commerce. World Survey of Foreign Railways: Supplement #50. Washington, 1938. Supplement to the original 1933 survey reports 19 standard gauge vehicles for the electric line: 11 passenger cars, 5 tank cars (? ), 1 locomotive, 1 work car and 1 line car; and 91 meter gauge vehicles for the steam line, including 2 locomotives and 18 passenger cars. [Anonymous, untitled article] in ERA Headlights (Hoboken, NJ), August 1946, p. 3. 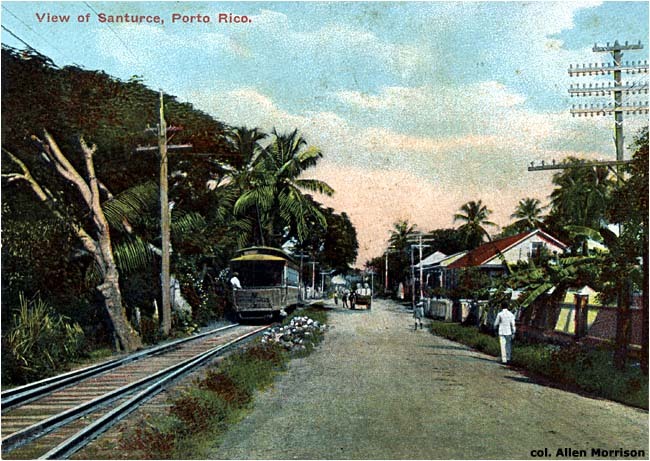 Track map and history of the San Juan Santurce Street Railway. 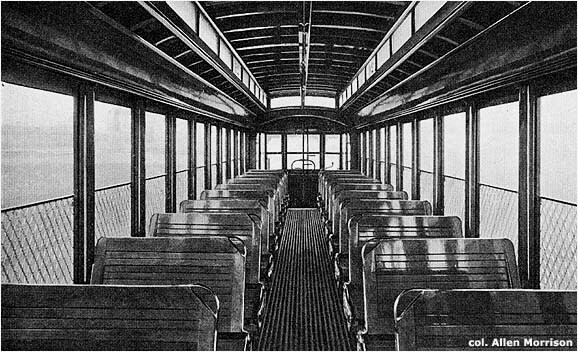 Article states that "all of the street cars are second hand", which is untrue, but otherwise provides a nice description of the system's last days. The author was unaware how very few remained. "Un ruidoso pasaje llegó hasta la última parada" in El Mundo (San Juan), 2 October 1946, p. 7. 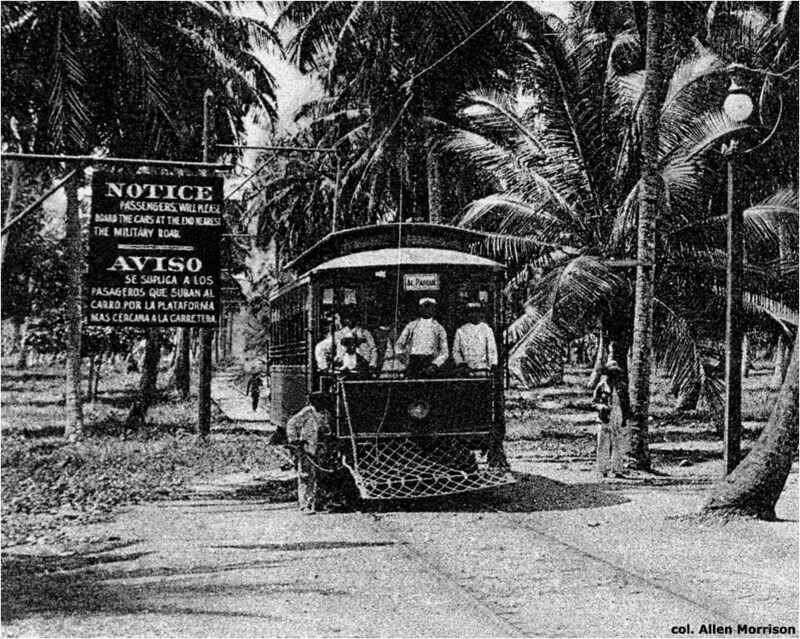 Feature article on the end of tramway service in San Juan. Large photographs. Adolfo de Hostos. Historia de San Juan, Ciudad Murada. San Juan, 1966. This 590-page history has chapters on "El Tranvía de Ubarri", pp. 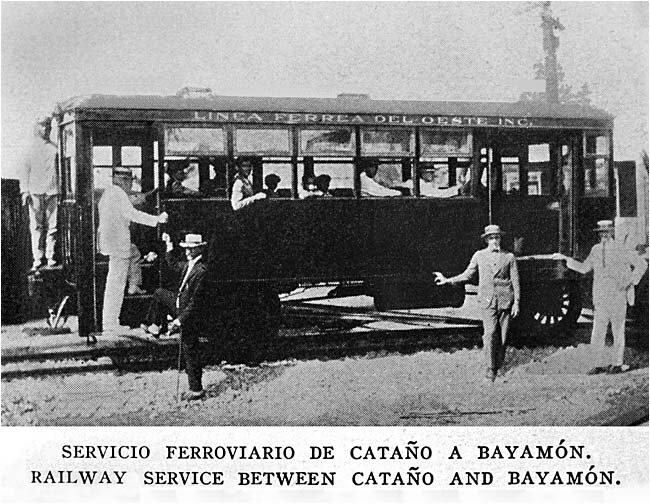 89-92; and "El Tranvía de Cataño a Bayamón", pp. 149-150. Latter chapter doesn't say when the line closed. Emilio E. Huyke. 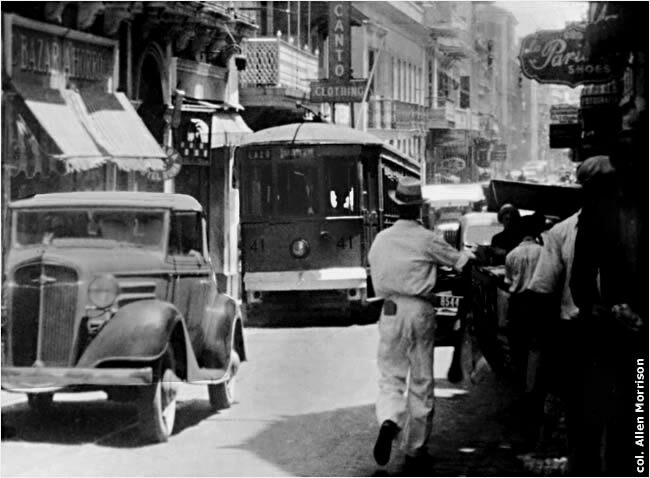 Historia de la Transportación en Puerto Rico. San Juan, 1973. 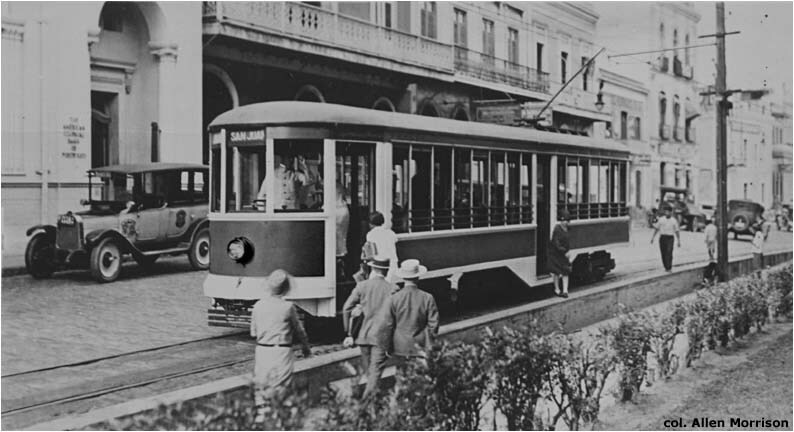 The chapter on "El Tranvía" provides a nice general history of tramways on the island, with emphasis on San Juan. Oscar L. Bunker. Historia de Caguas. Caguas, 1981. The plan to extend the Río Piedras electric tramway to Caguas was abandoned and a steam-powered railway was built instead, Tomo II, pp. 229-230. "Clang Clang Clang Went the Trolley: The Ultimate Trolley" in San Juan Star, Sunday Magazine (San Juan), 24 July 1983. 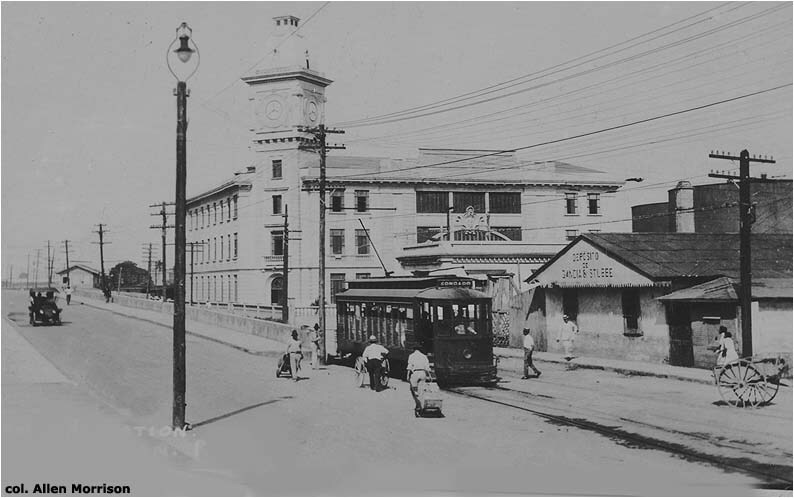 Memories and testimonies from old motormen and conductors about streetcar operation in San Juan. Aníbal Sepúlveda Rivera. San Juan: Historia ilustrada de su desarrollo urbano, 1508-1898. San Juan, 1989. Impressive, large format, 336-page survey of the city's development during its first 400 years. Hundreds of photographs and diagrams. Drawings of Ubarri's tramway terminal on pp. 210-211. Maps showing railways on pp. 238-239, 314-315 and 332-335. Unfortunately, there are no pictures of trains or trams. Florencio Sáez. Río Piedras: estampas de mi pueblo, 1898-1945. San Juan, 1996. Chapters entitled "El Trolley", "Ruta del Trolley" and "Estación del Trolley", pp. 44-46, provide detailed information about the city's first electric line. Moody's Manuals (New York). 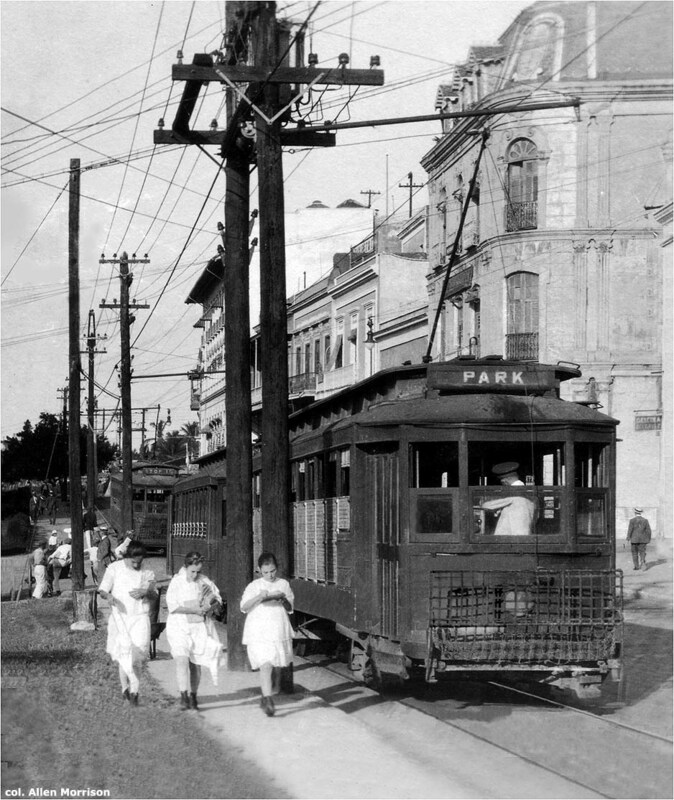 Annual editions provide historical background, information on finances, data on rolling stock, system length, etc., of the various tramway companies that existed in San Juan in the early 20th century. Archivo Histórico y Fotográfico de Puerto Rico - Colección Rodríguez / Historical Ephemera and Photographic Images of Puerto Rico from the Rodríguez Archives Collection. Extraordinary assemblage of historic material, photographs, postcards and other documents, indexed and cross-indexed by subject and locale. Highly recommended. In addition to the authors and photographers noted above, the author would like to thank Dave Deyo of Somerset, Massachusetts, for the valuable information and illustrations that he provided. They have greatly enriched this page.